Novacain is still dominating... and now he's got chicks chasing him in the 2 hole. The NFL games continued to be pretty predictable this week. Despite the bye weeks starting (14 vs 16 games), most of you pulled double digit scores. Texans 29, Raiders 6. I guess every team needs to a little Raiders to make them feel good about themselves every once and a while. 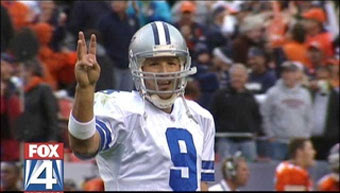 Romo on Fox 3...errrrrrrrrrr 4.